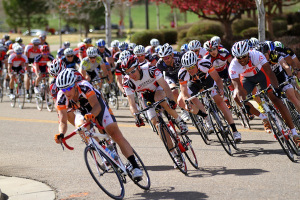 Many of your athletes have probably already started their early season races. But as a coach, have you laid the groundwork to coach them through a successful season in the next several months? Take our “pop quiz” and find out. Here are five questions we think that all coaches should be able to answer about their athletes by this point in the early season. 1. What are Their Goals for the Season? This is probably the biggest question to answer and the one that sets the tone for everything else. Hopefully you’ve identified some process and results goals with each athlete. Since the result goals will revolve around racing it is important to identify the “A” and “B” priority races. By prioritizing the races you can create a better map to success. As a general rule, an athlete should only have 3 to 4 A races and they should be spaced out accordingly. B races are best used to gauge fitness, try new strategies, finalize nutrition and test equipment. Factor in any travel your athlete may have for work or vacation to minimize mid-season disruptions (more on this later). Setting goals and A races is the framework for the season. 2. Are the Athlete’s Zones Correct? This is something that needs to be addressed year round. Zones for running can be done via heart rate or pace, and cycling can be measured in terms of heart rate or power. If you are working with a new athlete, or if an athlete has extended their off season, you’ll need to do an initial test to find your baseline. There are several ways to have an athlete do field test. A common one is Joe Friel’s method of doing a thirty minute time trial and using the last twenty minutes of data to set the zones (see his “Quick Guide to Setting Zones”). The key is that as athletes progress, particularly during the build phase, these zones can change rapidly. You can prescribe field test more often, or a great option is our new Threshold Improvement Notification feature that keeps coaches up to date on their athlete’s threshold. By implementing this feature you can be sure your athlete is always using their most current threshold and the most up-to-date training zones. 3. How Much Workload and Recovery Time Does The Athlete Need? As you all know, recovery is a key aspect to training. By now you’ve hopefully gone through a few cycles with your athlete and have a feel for how much training they can handle. While communicating with your athlete is always good, you can also use the Performance Management Chart (PMC) to better predict when an athlete needs rest. By using the Training Stress Balance (TSB) statistic within the PMC, you will have numerical values that give you a better view into your athlete’s level of fatigue. This will allow you to prevent overtraining before it happens. Looking at PMCs and TSBs past and then correlating to peak performances can show you how quickly an athlete responds to rest periods. This lets you tailor the duration of recovery needed for each athlete. Over the course of a few cycles, you will quickly see patterns that develop within their PMC. Looking specifically at the Acute Training Load (ATL) and Chronic Training Load (CTL) numbers will allow you to accurately predict and be proactive rather than waiting and being reactive. The PMC can also be used to look back an athlete’s training in order to determine proper workloads. The PMC can be set to view data from all of last year, the same week last year, the past 90 days or custom dates to find the peaks (and valleys) that occurred. Using historical ATL and CTL data gives you a better map to reference when setting the schedule. For instance, if you know from last year’s data that when your athlete’s CTL was over 80 they needed rest, you can be sure to schedule rest before they hit that point. 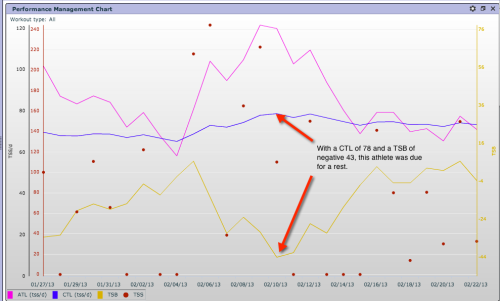 You can also use accumulated TSS points over the week as a measure of the workload an athlete can handle. It can be hard to determine just how much work to give an athlete, and often the athlete feels like they need to do more, or that they are letting down the coach by being tired. You can view accumulated TSS points by week in the Dashboard or in the weekly summary chart managed in your Account Settings. Again, this is another way to numerically determine workload and fatigue to avoid overtraining. 4. What are the Athlete’s Strengths and Weaknesses? Every athlete has their mix of strengths and weaknesses and knowing them is crucial – especially if you believe an athlete should “race their strengths and train their weaknesses.” Triathletes in particular need to juggle three sports and having them work on a weakness while maintaining their strength takes balance. Depending on the sport that needs to be brought up, this can take a lot of training hours or relatively few. It will take more hours to build an athlete’s cycling than it will their swimming, for example. Knowing the athlete’s past athletic history will help with this, but there are certain charts and tools within TrainingPeaks that can help as well. Found in the Dashboard, you can use metrics like “Time in Heart Rate Zones” to make sure the athlete is focused on the appropriate heart rate. This can be very helpful as you transition from base miles to more pace or heart rate driven interval work. 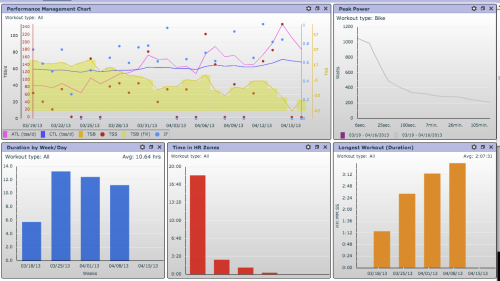 Or cyclists can use the “Peak Power Chart” to determine an athlete’s power curve and areas of improvement. Not only is this a key for triathletes juggling three sports, but for cyclists and runners as well. Aspects like endurance, high aerobic work and strength all come into play. If you want to become a better sprinter on the bike that takes specific work, as does running in the hills. It is best to identify weaknesses that may affect your athlete’s A priority race. 5. How Much Vacation Time Is Scheduled? This is a big one for many athletes. The when, where and how long of a vacation period is crucial to long term planning. Obviously, the goal is to minimize the effect on training, but in most cases compromises need to be made. The best case is for an athlete’s vacation to fall in a natural rest period. If so, lucky you. If not, begin to look at the where and when of the vacation. Running while traveling is usually pretty easy, but cyclists and triathletes may need to get creative. Will a pool be an option? What about bringing or renting a bike, or finding a gym to drop into with a stationary bike? Talk with your athlete about what they can reasonably expect to get done (it is vacation time after all) and set a plan. Don’t wait until they are gone to answer these critical questions. Now is the time to make decisions and turn your thoughts to the races ahead. Answering these questions now rather than later will allow you to create the best plan for each athlete…leading them to success.